These days it is fairly common to have friends who follow a gluten-free and or dairy-free diet, which has inspired me to try new appetizers and side dishes for parties. 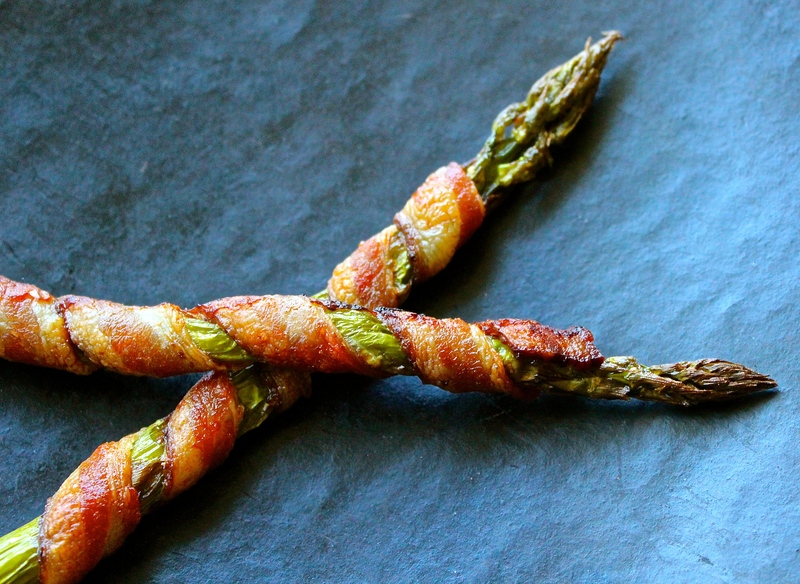 Like this one…bacon wrapped asparagus. It is easy to prepare and it must be good because my kids, who wouldn’t touch asparagus, like it now. To make some for yourself, cut slices of bacon in half lengthwise and wrap the strips around thick stalks of asparagus. Bake them until brown and crispy. Next time I think I will double the batch because they taste good and they are full of health promoting nutrients like potassium (for heart and kidney health), folate (for energy production and blood cell formation), vitamin K (for bone health), rutin (for blood vessel protection), quercetin (anti-inflammatory), saponins (anti-tumor), glutathione (anti-oxidant), and inulin (pre-biotic). On day 66 of this 365 day project, I ate my daily five (including some fresh tomatillo salsa, which I am going to try to learn to make at home because it was really good). Did you enjoy yours? I’m the friend Kristen made the asparagus for and I can vouch for how amazingly delicious they were! I ate more than my fair share! Thank you, Kristen, for always filling our bellies with your delicious and very nutritious food, as well as inspiring us to eat more vegetables.